As I sit here on the morning of February 7, 2003 and gaze out of my home office window in New Jersey and read the articles on the Blizzard of 1978 I see snow falling. They say three to six inches. We already have at least five. I look against the wall and see a yardstick that is 25 years old standing there commemorating that faithful day in 1978. Will today be like 1978? I began to get telephone calls from people who lived in the suburbs. Is there work? Well, use your own discretion. Then I looked out the window of my office at One Beacon Street and saw all this snow coming down. I called the boss, who called her boss and was told to shut the place down. I called home and was told that the school bus had delivered my daughter right back home. They never got off the bus we were told. I headed back down to Park Street and got what turned out to be the last subway train to Dorchester. We got stuck going around the curve going into Fields Corner station. Another train behind us tried to push us but could not. The T sent a train out from Ashmont which dragged both trains into the next tunnel. They held the last trolley for us. I got home three hours after I started but at least I got home. I got off the trolley at Central Ave. and walked over to the Star Market and got some groceries, cash a check and started up the hill. Little did I know I would be marooned there for the next week. Nothing moved. We had put the child seat for my daughter's American Flyer sled in the attic as she was way to big for it. We put it back on the sled and tied an orange crate to it. There was a path in the street that had been worn down by people walking over to the market to get essentials. We did errands for the people who could not get out. We did not have electricity but did have a gas stove with a heater in it. I guess we were lucky. We had pantries in those days so always had a good stock of canned goods. We were very happy to see the National Guard plow their way up the street on Friday. I use to love snow but no more. already gone, and a small storm after that which was already gone as well, so the attitude about snow was one of Chicken Little. We had heard it all before. the time (my how things change), so fortunately for me at least I didn't have to go to work. I had a VW Bug (the kind with no heat) and it was safely parked across the street. In Fall River, you could only park on one side of the street during the winter for snow removal so I was happy I was 'legal'. My mother was alive then. I had asked her when she was going to make an Apple Pie. She said she was getting 'too old' for that. My sister Elaine was a nurse at Truesdale Hospital in Fall River, so she went to work at 7 am and worked until 3:30. She is only 4'10'' tall and like everybody else that day she went to work without boots. There was no snow on the ground at 7 am. The streets and sidewalks were bare. On this day, she decided to carpool with a neighbor, Doris Fabian, who also had a VW Bug (with no heat). It was at 9:30 am when I was having coffee with my mom when I looked out the window and saw the first flakes. I said, "Here it comes". My mom said "and Elaine went to work without boots!" I decided to take a walk to Roland's Variety in the Flat Iron Building on Second Street, which was just one street over to get a paper. I always liked taking walks and smoking butts. I don't remember if I took a short cut through the Bouchard's yard, maybe I did. When I came out of the store, (I was only there for about 5 minutes) and it was already whiteout conditions. It was only 10:30 am and it was very quiet, but occasionally, I could hear that cars were already having trouble coming up the hill on Middle Street. At it was only 10:30! At 12:30, my next door neighbor, Mike Ellen, asked me I would mind going with him to pick up his wife Pat at the Morton Middle School across town. Having no job, and a fresh pack of butts, I said sure. It is normally a 15-minute ride, but it was snowing like hell as we left. Getting there wasn't that bad, since the snowplows had made a first pass and Mike kept to the main streets. We got to Morton about 45 minutes or so later. Pat got in. Getting home was not so easy. Windshield wipers were going crazy and visibility was poor when we set out. We had to wait for Pat a few minutes. It was probably close to 1:30 or so and we traveled about 15 miles an hour from there. One of the stupidest things that the Fall River School system did was keep the kids in school until their regular time (2 PM). It was just about that time that Mike Dukakis declared a state of emergency and was asking businesses to close early and let workers go home. Our quiet (up until then) streets were no filled with school buses making frequent stops (we got stuck behind a few) and all the business people were now hitting the streets at the same time! Traffic crawled at anywhere between 2 and 5 miles per hour from then on. Good thing Mike put gas in the car. He had a Toyota (with heat). How we every made it I'll never know. Both Pat and me had to pee real badly. How he made it up Middle Street, where he finally found a parking place I'll never know. We walked the rest of the way home. It was just around the block. It was now 5:00 PM! Meanwhile, my sister Elaine and Doris left work at 3:30 PM in a VW Bug (with no heat) and they almost ran out of gas idling in traffic. I got home and my mother was so worried about us (Elaine and me), that she had made that Apple Pie! We sat around the radio listening to storm news. There were reports of missing city buses. This was a time before cell phones so they were asking people "If anybody has seen the Rodman Street bus, please call the station". Elaine finally got home at 11:30 PM that night! Since she was a nurse, she was REQUIRED to go to work the next day. The city had to send a 4-wheel drive vehicle to pick her up for work the next day. All driving was banned in Fall River after 5 PM. You could get arrested if you were driving just for the hell of it. Some people abandoned their cars on city streets making things worse. Some people simply ran out of gas. There were Fall Riverites who were stuck working at their jobs in Providence, 17 miles away. Some drove to the state line, only to be told they could go no further and had to walk to their homes in Fall River. I had even heard of some people walking the entire 17 miles home (on I-95) when they were told that they would be stuck at work for 8 days. Work was canceled for the entire week and people who had jobs could collect unemployment for that week. My friend and next door neighbor Bobby Pacheco also had a VW Bug (with no heat). He worked at the Fall River Nursing home at the other end of the city. He also had to go to work because he was a chef and the elderly need to eat. The next day, he walked from Whipple Street (where we lived) to the North End in waist high snow. It took him 8 hours to get there and he ended up staying at the Nursing Home for 8 days. He got written up about his walking odyssey in the Fall River Herald News (where he would later get a job). Once we were all safely home me, Pat, Mike and Elaine (when she was home) would play Yahtzee and Monopoly and Racko for hours on end and getting all liquored up. The Blizzard also had long lasting effects. I got a job at K-mart in May. The following December I was working at K-mart when the store could only open on the 5 Sundays before Christmas. On one of the Sundays, it was very busy and it started to snow. People left their carriages full of stuff in the aisles and ran to their cars. The memory was still fresh. It took maybe another year before New Englanders started to take snow for granted again. 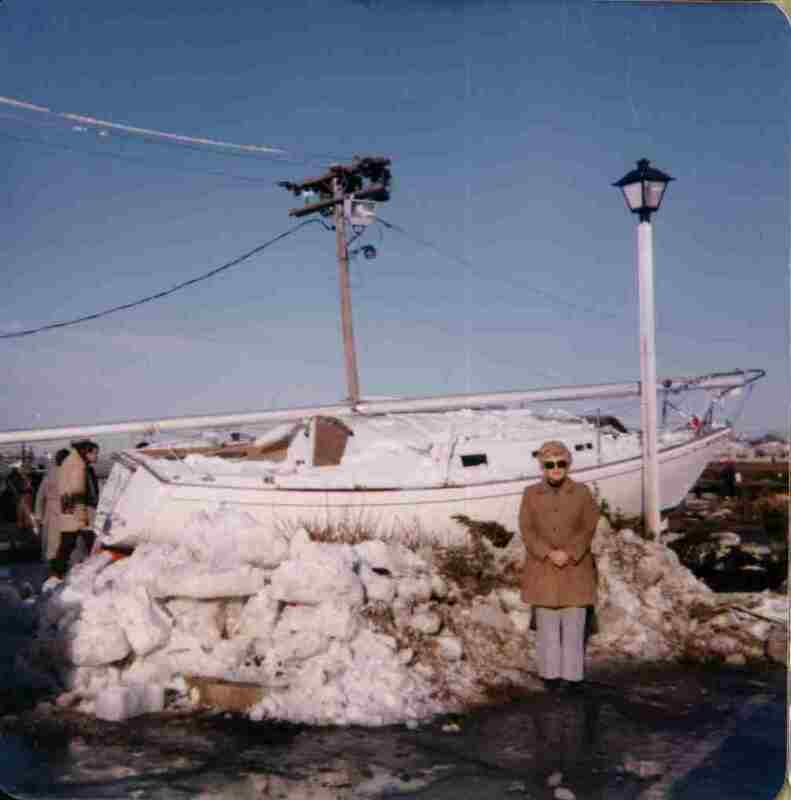 While collecting stories of the Blizzard of '78 from folks in Hull, I received a few from people who where in others parts of New England during the storm. Since I was living in Brockton at the time I thought I would include these stories from other areas and add my own. If you would like to have your story included please send it along and I'll be glad to add it. Would like to hear some from the mid-west. 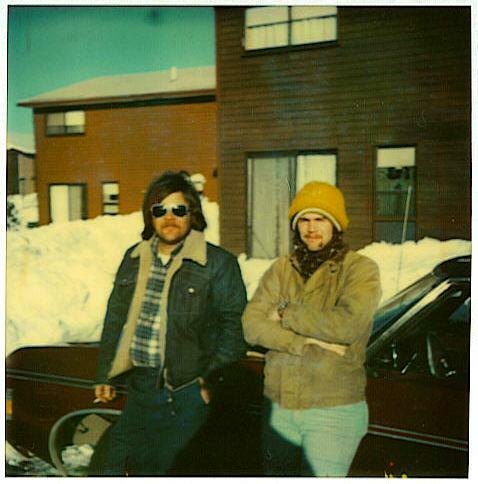 The blizzard of '78 provided so many with unforgettable memories. For some people the memories of the storm included fun adventures through the snow and of camping in their own homes without power. While some people, who were able to take the storm in stride, conjured up great snow-infused photos for the next winter's custom Christmas cards, many others were not so jubilee. For most, since it was a National Emergency, they had to make due with more snow than they knew what to do with. Traffic completely stopped, there was a wide range of power outages, people were stuck at their places of work and boats and harbors were turned into debris. Above all else lost or ruined, there was the tragedy of lives lost. Send to Bruce Simons at: mrmoose143@comcast.net. This story came from Leslie Kasanoff formally of K Street, Hull. Now living in sunny California. I wasn't in Hull, but I can relate my story anyway cuz it was both scary and fun. At the time I was living in an apartment in Boston and working evening shift as a lab tech at the Deaconess Hospital. We woke up to probably about 18 inches of snow and no electricity that morning. Since the Deaconess was only 2 miles away and since the roads were closed and a National Emergency had been declared, and the trolleys weren't running, I knew I had to walk to work since my job was considered essential and I lived close. I was sitting in my living room with my roommates listening to WBZ radio whose offices were on about the 50th story of the Pru and they were relaying the story as they watched the snow plows below: A small snow plow got stuck in the snow. So a bigger one came to rescue it and it got stuck too. Then another came to rescue it and IT got stuck. Then a tractor came to rescue it-you know the ones with tires bigger than a person!- well it got stuck as well. And here I sat thinking "I have to walk 2 miles in this!!!!!" Well, fortunately by the time I had to leave for work-about an hour after I heard this story, the snow had stopped and since the roads were closed there was no traffic and the National Guard had plowed many of the streets. Of course you remember the wind was blowing at hurricane force! I had every inch of my body covered when I left the apartment. I told my roommates exactly which roads I was taking and that I'd call when I got there. "If you don't hear from me in an hour call the police and tell them I stuck in a snow bank somewhere" I told them. The walk was pretty uneventful and actually kinda fun. The only somewhat interesting thing that happened along the way was the conversation I had with the security guard at Children's Hospital as I passed it on the way to the Deaconess. With my navy blue down jacket, black ski pants, red rubber boots and red scarf over my face and head it seems he thought I looked like Darth Veda!! Oh ya- and the difference between health care then and now-everyone that showed up to work stayed and worked a double shift and got paid for it dispite the fact that there were double the amount of people we'd normally have for a graveyard shift and about half the work! This is my own story. Not much to it and one of the reasons I started this page. After hearing a few of the other stories I was amazed at how much I had missed. I myself missed all the fun of being on the water during the blizzard. I was living in Brockton and working at Child World in Shrewsbury at the time. The morning of the storm I woke up with a fever and had called in sick to work, not knowing that the little snow fall outside was going to turn into one of New England's biggest storms. I lucked out. Because Shrewsbury didn't get that much snow from the storm and the store never closed during the whole time everyone else was being buried. If I had gone to work, I wouldn't have gotten out until 10:00 PM that night. I would have ended up stranded on I-495 for sure. Back in Brockton it just snowed, and snowed and snowed. Now I love the snow and love to shovel snow, boy did I have a blast, that 1st day after it stopped I was in my glory. I remember the snow at the front door was 4 feet high in the morning when we opened it. My daughter Monique couldn't believe it. We were living at the Chatham West apts, off Oak Street at the time and needless to say the cleanup took forever. We lived close to the West Gate Mall and even though it was closed, there was a super market that was opened. No bread or milk, but we got by. There was one guy, Lenny, who lived up the hill, and even though all the roads were closed, he drove anyway. We did daily trips to the store. Six of us would pile in his car and we'd zoom over for whatever we could find. We did get stopped by the police once, but they let us go. The whole week was like a party. Only down side was that when I finally made it back to work, they told me since the store never closed that week, that I wasn't going to get paid. Just loved how those guys at Child World treated their employees. After that I went into work every time it snowed. A couple of times it took me 3 - 4 hours to get in and I'd find the store closed. No one bothered to call me and let me know. I didn't get paid those days either. They said I couldn't prove that I came in. And they wondered why I left in the spring. Copyright © 2000-2013 Bruce E. Simons. All rights reserved. This story came from the guest book. Steve Low coming back from Chicago in my tractor-trailer. Living in Rhode Island at the time. I remember hearing on the CB radio, when I was in Pennsylvania coming across I-80 from the guys that loads in Boston heading west, that I was in for a hell of a time. My load was going to Boston. It was around 10 p.m. and I was hungry. I didn't dare stop for fear that I wouldn't be able to get into town. Anyway, I remember coming down the hill, on I-95 at the Connecticut/Rhode Island line and seeing all kinds of blue and red flashing lights. The RI State police and the Conn. State police AND National Guard had I-95 blocked off. WOW, I said to myself must have been a hell of an accident up ahead. Just before they made me get off exit 1, I lowed down enough to ask the trooper what happened. His words to me I will NEVER forget. "Where the hell have you been boy?" "The BLIZZARD has hit New England and all roads are closed except for Emergency Units." I said, "WHAT THE HECK ARE YOU TALKING ABOUT", I told him that I was coming from Chicago and if he wanted to see some snow, then he better go out there. (now keep in mind, it was NOT snowing there yet, and the roads were DRY.) He said that I had to exit here and go into the truck stop that was there until further notice. I said O.K. and got off exit 1. As I came down to the stop sign, instead of turning to the left to go to there, I turned right towards route A1A which ran along the RI coastline. You won't believe it, but I only got about 4 miles and it started to snow. Well, it got really slippery, real fast. It was also getting real deep, real fast. I found A1A and tried to turn north and head toward Providence. The truck slid a little bit but I made it. This was about midnight. Absolutely no traffic except ME. Well, by this time, the news channel on the radio was telling people that "Marshal Law" had been enacted. I had only gone about 8 miles on A1A when I realized that the snow was up the middle of my wheel while I was driving. I was "plowing" it with my bumper. Well, I made it to the yard of the people that I worked for in Warwick, RI and parked the truck. That was as far as I could go. Just pulling in the yard was a problem but I got it off the road anyway at least. I couldn't find my car. '78 T' bird. It was gone. My wife went with me on this trip and pointed out that the antenna was sticking up over there, where we parked it. We couldn't move. I remember getting out of the truck and just about stepping right onto the snow. It was over 25" high. Well, we walked home from there. We lived in RI. We walked about 2 1/2 mile and it took us 3 hours. We almost died. It was unbelievable. You couldn't breathe from the cold and your eyes hurt from the blowing snow. We got into the house and found everything working. The next morning was a different story. We lost power around 4ish in the morning. Then all the normal trouble started just like everyone else. We had 37 inches of snow in 28 hours. I will never forget the next 2 weeks after that. 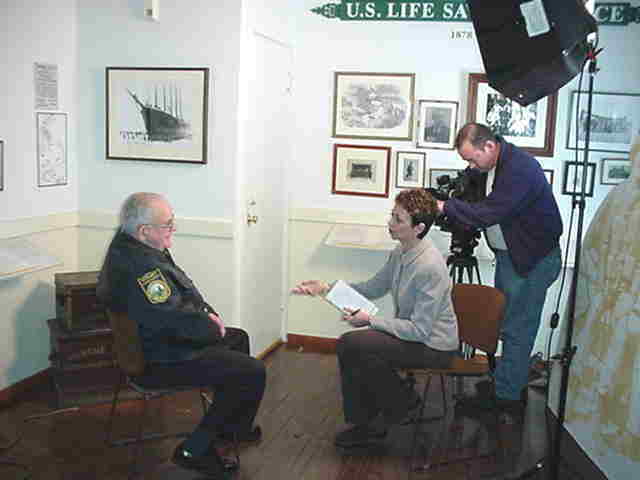 Elmer has been with the Scituate Harbor Master's office since 1969 when he became an Assistant Harbor Master. He was promoted to Harbor Master in 1988. His most vivid memories of the Blizzard of 78 began when two people lost their lives during an evacuation on Jericho Road. While in a rescue boat a wave broke over the sea wall a half mile away and traveled through the back yards of homes in the area. The wave was so large that it hit and threw the boat around dumping the passengers over the side. 5-year-old Amy Lanzikos and her neighbor Edward Hart were both lost. 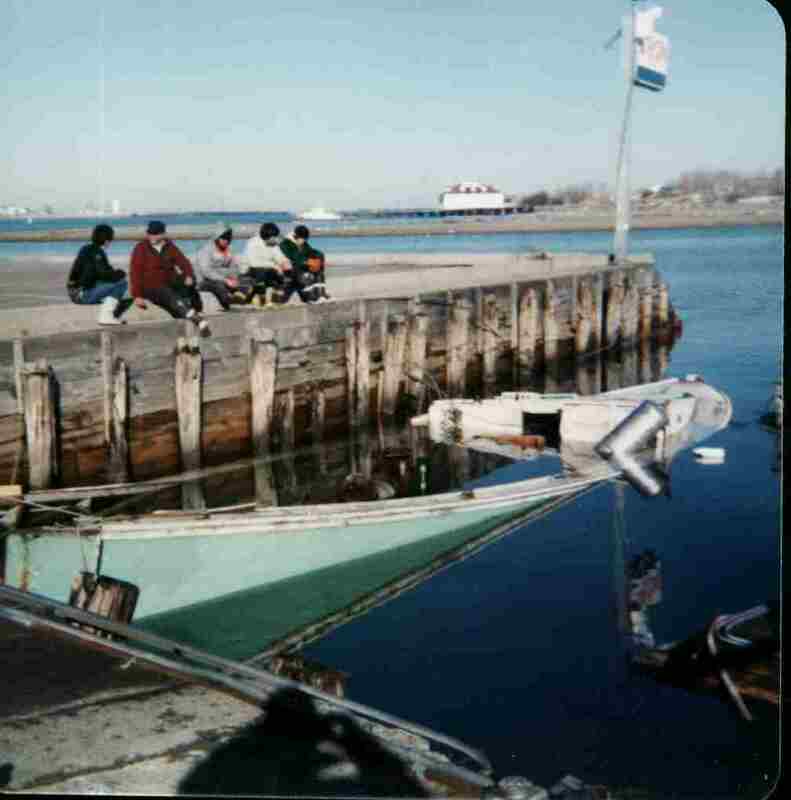 Amy was found a short time later in the harbor. Mr. Hart, although in dressed in bright yellow foul weather gear, could not be found. Elmer was assigned to a National Guard Helicopter to help search for Mr. Hart. They flew over the coastline of Scituate for two weeks before the search ended. Mr. Hart was found in April caught in the town floats. During the search period, Elmer recalls that they took several detours all along the damaged coastal areas, flying members of FEMA (Federal Emergency Management Administration) and officials from Massachusetts, to view the devastation. 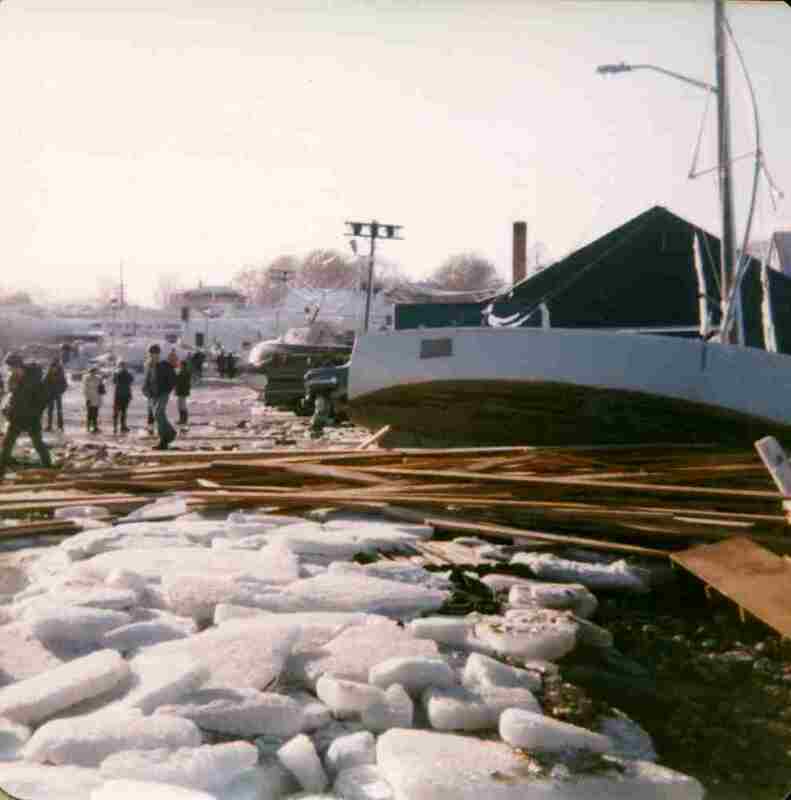 When the tidal surge came the seas rose 17 ½ feet in Scituate Harbor. The US Coast Guard stationed in Scituate was called to help rescue some of the fishing trawlers that were docked at the town pier. While trying to maneuver in the 8-foot waves and 100-mph winds the 44-foot boat became hung up in some lines and lost steering control. 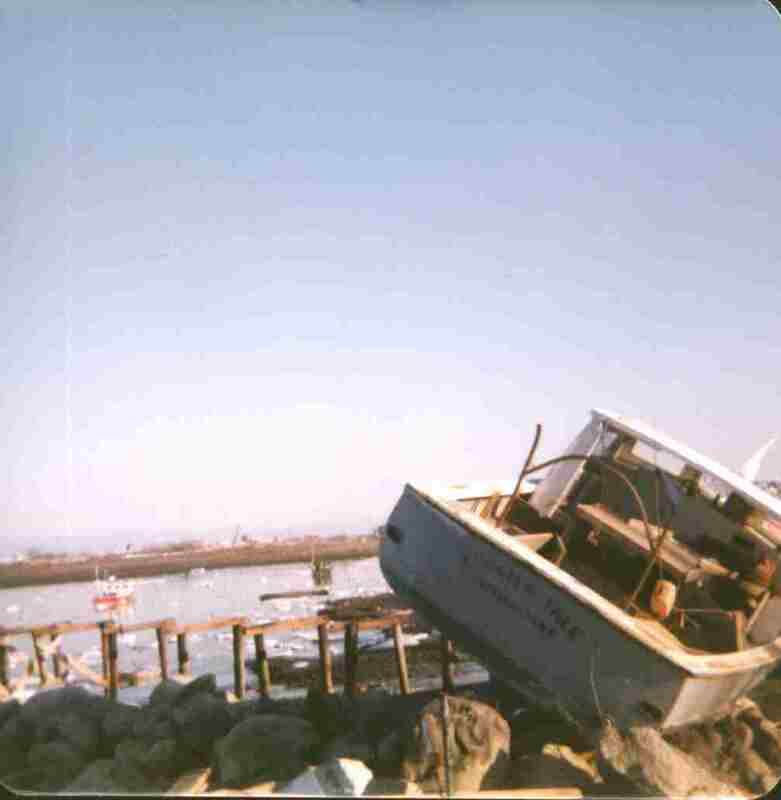 The winds and ocean quickly drove the boat and its' crew of four up onto the rocks behind TK O'Malleys. Elmer was called and he rescued the sailors. He said they were very close to being lost. The boat was slammed onto the rocks so hard it sounded like a drum. Later when the tide went out, the fishing boats helped pull the Coast Guard boat back into open water. Later that day Elmer had gotten a call from a friend who lived on First Cliff in Scituate and he told Elmer that he had gotten a reading of a wing gust of 110 mph before the wind ripped his meter out. Exhausted Elmer went home. He said there was nothing more they could do. The next morning he received a call from the Scituate Police that he was needed to rescue some folks on Surfside on the North Beach. A Duce-and-a-half was sent over from Hull to assist. They had to stop as they passed each house and wait until a wave broke through between the houses and had to dodge furniture that was being thrown around by the waves. The flooding was extensive. The entire harbor area was covered with water and ice all the way to the Driftway area near route 3A. At one point they were hit by a huge wave and they started to tip over. Elmer had on a life vest but the driver didn't. Elmer yelled to him if they go over, that he should grab a hold of him and swim to a nearby tennis court fence. There they would use their belts to strap themselves to the fence until help came. Fortunately the vehicle didn't roll over. Once it was back on its wheels they turned around and headed around to rescue 15 folks from the Gannett Ave. area. Once everyone was loaded they headed towards the High School which was being used as a shelter. Going past where the Widows Walk Golf Course is today, the duce-and-a-half began getting hit by blocks of ice coming from the North River. At one point a large block of ice hit the truck and caught the front tire, causing it to whip around spinning the steering wheel and braking the thumb of the driver. Every time a block of ice hit them it sounded like bowling pins being knocked over. Elmer was referring to their passengers. They did get thrown around some, but came out of it okay. Later that day they got a call to rescue more people over at Lighthouse Point. They had to wait for bulldozers to clear away rocks from the road so they could pass. At the lighthouse the stones were nearly 15 feet deep. Some of the people here were in their 60's and 70's and did not want to leave their homes. They were afraid there would be nothing left for them to return to. They had to be ordered to leave and each just grabbed a pillowcase and threw a few things in it. One of the current Assistant Harbor Masters was a child and had to be rescued during the storm. The fishing fleet lost 10 boats. Another 15 20 boats washed out to sea in their cradles from one of the boat yards. Hundreds of homes where damaged or destroyed. His biggest regret from the Blizzard was that due to the 8 foot seas, 100 mph winds and blinding snow, for the first time in his life he had to admit that he would not be able to do a rescue at sea. When he looked out past the harbor towards the ocean near Scituate Lighthouse he was in total amazement at the power and furry of the sea. It has been something he will never forget. Not even when he was 12 and assisted in the rescue of people and boats in Quincy during the Hurricane of 1938, did he feel so helpless. I was stuck at Fort Devens, MA for 1 whole week. The1st day that storm started I was leaving work and we had 12 plows ready, the 1st day it started we were plowing till midnight. Tuesday, Wednesday and Thursday we where still plowing. 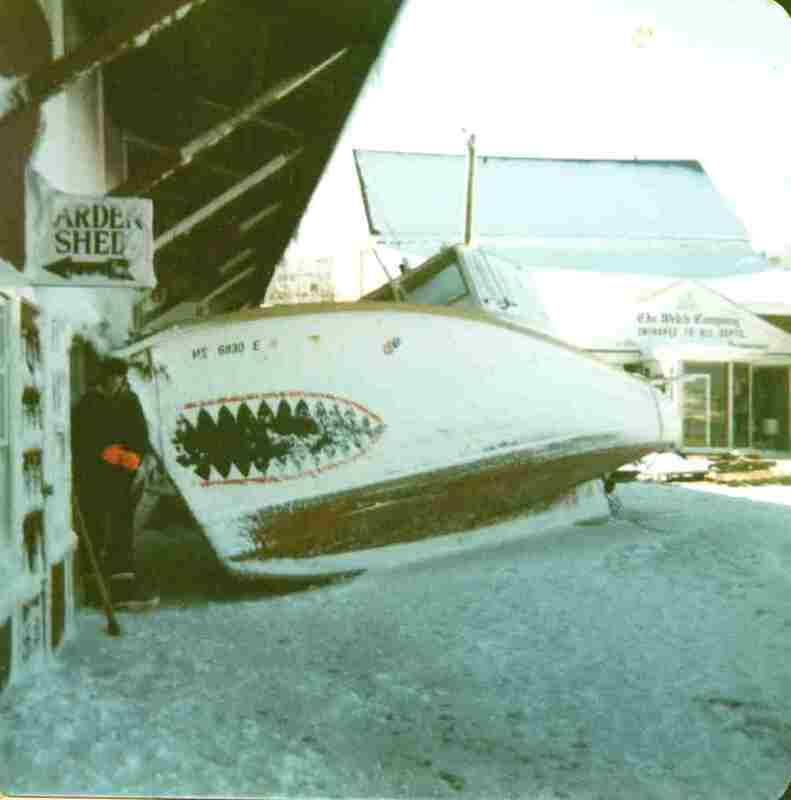 I still have vivid memories of the Blizzard of 78'. I remember watching cars stopping on Route 128 on the TV, becoming stuck because of the snow pilled around and over them. I remember telling my Mom and Dad that my twin brother and I were going to snow shoe out to Route 128 and help feed people. My Mom said no your not. Go out and shovel.... I remember going to the store the next day and picking up groceries on a sled with a long list for our family and the neighbors..... But most of all I remember, no cars, the quiet, the air began to smell fresher. The people became friendlier... And shoveling our LONG driveway took more than a few days. What makes the Blizzard of 78' so unique. Was it the most snow fall in a 24 hour period? I was an R.N. working at Long Island Hospital but when the storm came I was on vacation and living on Billings Rd. in No. Quincy. I couldn't get out for 2 days but as soon as I could walk I started to walk out to the hospital knowing that the nurses who were there would never leave until they were relieved. I remember going thru Squantum . The snow was knee deep and many logs and parts of homes and boat docks were everywhere. When I got to the middle of the bridge going out to Long Island I thought I might not make it but knew that no one would find me for a while, so I kept going and made it. Shortly after I arrived the Commissioner of Health and Hospitals put a call out on the radio for volunteers to help feed patients. At that time many had to be fed 3 times a day. A group of women from a church in Squantum asked for a ride from an army truck and they came out to help. In later days they became a big part of our volunteer program. I will never forget them. I was living in Brockton at the time (was it on Forest Ave). I was working in Downtown Boston. I was pregnant with my first child. I went to work that morning and did not really feel that well so I decided to leave work early and head back to Brockton. I got arrived home safely, although the trip took a little longer than usual. I only found out later that the bus I was on was the last bus to arrive in Brockton from Boston that day or any other day for the next week!!! My birthday is February 8, my birthday celebration that year was a little off with no cake and the only ice cream we could find was vanilla, found in a little store that we walked to. I was just so thankful that I was home with my husband laying around the shanty and not stuck in the office for 5 days like some of my co-workers!!! After reading the many accounts of the Blizzard of "78" on the Internet, which includes the Patriot Ledger, and the Marshfield Mariner. I feel compelled to tell my story. Especially since I was there 25 years ago. Right in the middle of the storm. My name is Charles "Hoppy" Ames. I was the Street Superintendent for the Town of Marshfield. My wife Patricia (now deceased) and I had been on vacation to sunny Florida. We went with Paul & Phylis Pelland, who owned Marshfield Family Skateland, in their Motor Home. That is another whole story in itself. Anyway we left for Florida in January to visit many friends we knew there. I missed the storm in January. But when I heard about it I couldn't wait to call our dispatcher at the Highway Department Bob Simmons (now deceased) and rub it in "hey Bob. it's 70 degrees out and the sand trucks haven't been by yet!" We had a few good laughs. I told him I'd be home Sunday February 4th. but I wasn't due back to work until the 7th. Monday bright and early I got a call from Bob. He said they had a report from weather Services and it didn't look good. We were going to get an "Ole Fashion Nor'easter"
It was a very blinding snow fall. The snow was being driven by excessive high winds, causing the snow to be flying horizontal, and so thick that much of the time I could not see the hood of the Town Car #102, a station wagon that I drove through out the storm. oil and back to the Esplanade to rescue more people. Joe Vining (now deceased) my right hand man and foreman was right there also performing his job well beyond the call of duty. In fact when I retired in June of that same year after twenty years of service. Joe took over my duties as Superintendent of Streets, until he also retired a few years back. All of the Police, Fire and all of the Town Employees did a great job during that storm, along with all the contractors, volunteers, and many of the citizens that assisted us in so many ways should also be remembered and thanked. I lived on cigarettes and coffee until Thursday when I finally got home to get some sleep. Believe me the adrenaline starts to flow in this type situation, you couldn't sleep anyway, even if you wanted to. 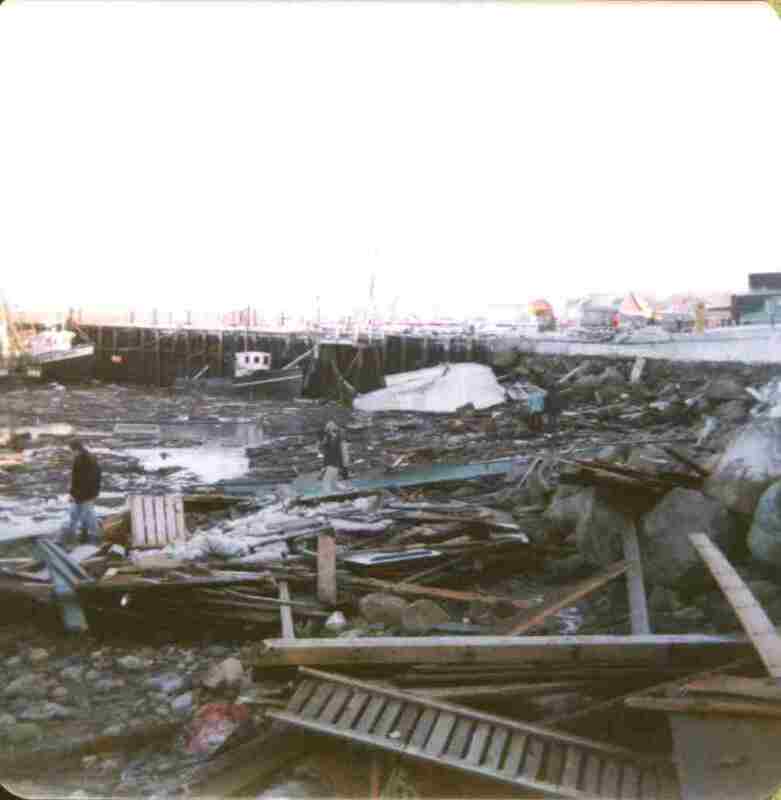 Marshfield was declared a Disaster Area along with the entire South Shore by then Governor Dukakis Thus making us eligible for Federal Assistance. The National guard was also called in to help. We soon had a fleet of Army Deuce-an-halfs hauling fill from the Town Dump (Landfill Site) to the beaches where ever the Atlantic Ocean was breaching the seawalls & roadways. Unfortunately with the Federal Emergency Management Assistance program (F.E.M.A.) comes the mountain of paperwork in triplicate. Everything must be documented in order to be reimbursed this was followed by State, Federal, local inspection teams to look at Damage Survey Reports (D.S.R.'s). To follow up on site inspections and determine actual damage caused by this storm. What was the preexisting site conditions? actual payrolls figures, labor, materials, municipal equipment hours, contractors, etc. Debris removal cost, temporary repairs, emergency repairs, permanent repairs, all had to be accounted for. Every thing had to balance out to the penny. When I left in June of "78" I believe I had written D.S.R's totaling close to three million dollars. The duty of following up on these reports went to George Shaw who was the town's Purchasing Agent. I believe Marshfield finally got their money three years later. This was truly an on the job training exercise and learning experience for me. It did however come in to play for me when I went to work for the City of St.Pete Beach, Florida. 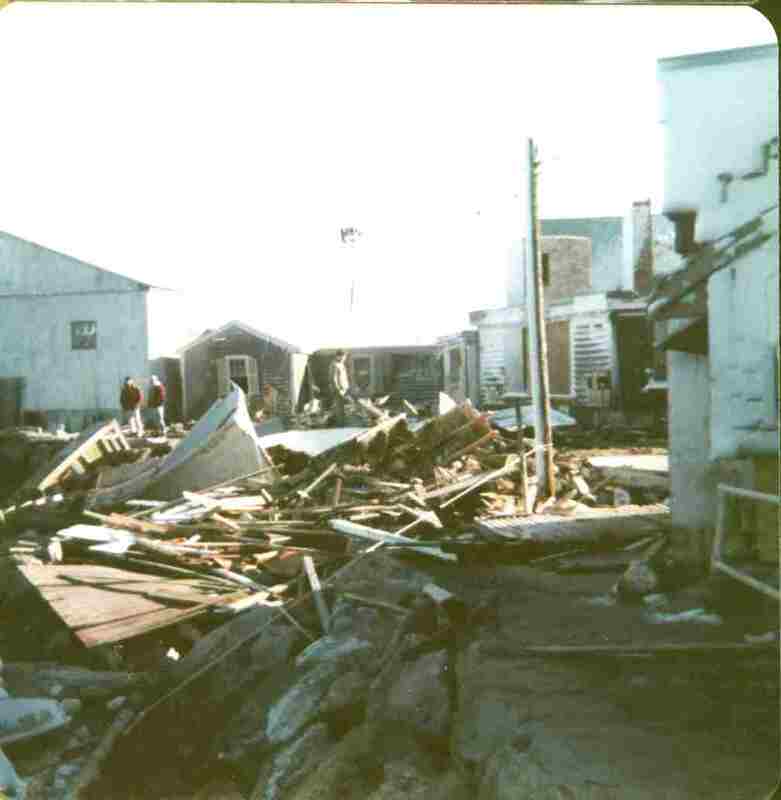 We sent Fire/Police and Public Works Employees to Homestead in 1992 to assist them in debris removal operations. I was given the task to fill out the D.S.R's for our people that were there. In order to receive reimbursement through F.E.M.A. The same held true several years after that when we sent employee's/equipment to Pinellas Park to assist in debris removal from tornadoes that had touched down in several areas. I remember going to work just like it was a regular day. Then it began to snow real light but steady and by noon time they said we could go home. I could not believe how much snow was on the roads as I drove by Carson Beach. The snowdrifts were all in the roads piling up like you would not believe. Cars were getting stuck all over the place I had to swerve around them so I could get up to the expressway. If I hadn't swerved around a bunch of cars I would have been stuck in South Boston for who knows how long. I was very lucky thank god, the ride home to Brockton usually took 45 minutes to an hour but this time it took me about 2 to 3 hours to get home. It was great though, because there were no cars on the expressway. You couldn't see any white lines on the road so I just went down the middle, and when I finally got to my exit it was all snow. It was like the snow plows hadn't even been there they just could not keep up with this terrific storm which lasted a good 3 days. I had 3 days off from work paid by the state. To get to any stores we had to walk or use a sled or a toboggan or ski-mobiles. We shoveled our driveway throwing the snow over our heads. There was no place to get rid of it. 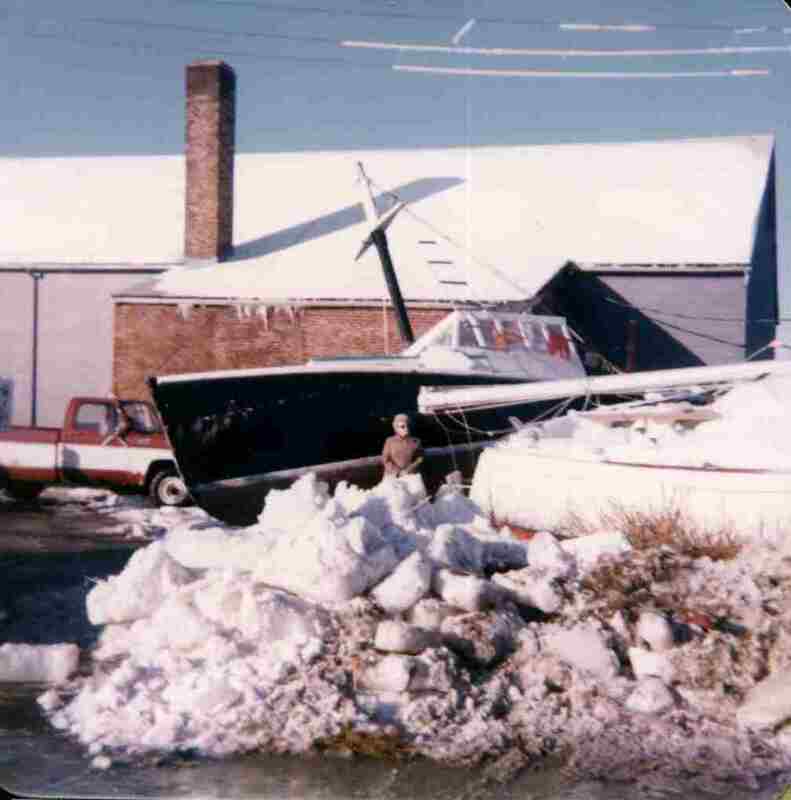 There has never been another storm like it to my knowledge and I hope we never see another one like the BLIZZARD of 78. I-195. It took me almost three hours to get from Providence to Smithfield where I lived. I thought I was going to get stuck several times. The power in my car kept dimming.... it was something else. When it was done and we had to dig out, it sure was a sight. We finally got to the local Almacs and there was one loaf of bread on the counter and women were fighting over it. I learned about your website tonight as I watched the Ch. 5 special about The Blizzard of '78. I was an Air Force pilot then flying C-130 turboprop cargo aircraft at Pope AFB, NC. I was one of the first planes into Providence bringing in Army and Marine bulldozers and all weather tracked vehicles. The soldiers told us that their mission was to clear the highway between Providence and Boston. Being from Falmouth, I just had to flight plan my departure over the Cape and was speechless at the sight on the Earth below. Now I'm back home in Falmouth and keep thinking that if a blizzard that bad hit again, would I rise to the standards of fortitude that all the residents displayed that week. How well I remember !! My husband and I lived in a small town in Clermont County in Southern Ohio. We weren't overly concerned when it first started snowing, but that thought soon turned into total chaos. In the middle of the night we were awakened by what we thought to be the kids kicking the bedroom wall. Since it was so bitterly cold ( chill factor 58 below zero ) we had all five children sleeping in the same room to stay warm. I got up to see what was going on, expecting to see the kids up playing. But all five were sound asleep. Just as I turned to go back to my bedroom I noticed the noise again. This time it seemed to be coming from the furnace room. I opened the door and it was jumping and shaking. I thought it was about to blow up. I woke my husband and he quickly shut the furnace off. After a few moments he discovered that the fuel oil in the tank was gelling up because it was so cold. He and the landlord stayed out side from one in the morning until daylight pouring hot water over the fuel tank just so we would have heat for the children. But that wasn't the end by far. The Power Station, CG&E, had a power failure and had to supply electric to different parts of the county at different times. We had electric for a few hours but a near by town didn't, then they had electric and we didn't. This went on for almost 2 days. During the next several days, even if you could get to the store, there was nothing to buy. Marshall Law was set into effect. There was to be nothing but emergency and police vehicles out on the roads. You could be fined if you were caught out driving during this time. It didn't matter anyway. Nothing was open, so there was nowhere to go. But being a small country community, people came out in droves to help those who were stranded. Some on snowmobiles, tractors and others on riding mowers with a wagon in tow to go in and get the stranded to safety. One lady went into labor and had to be brought down from a hillside by snowmobile to a waiting ambulance. 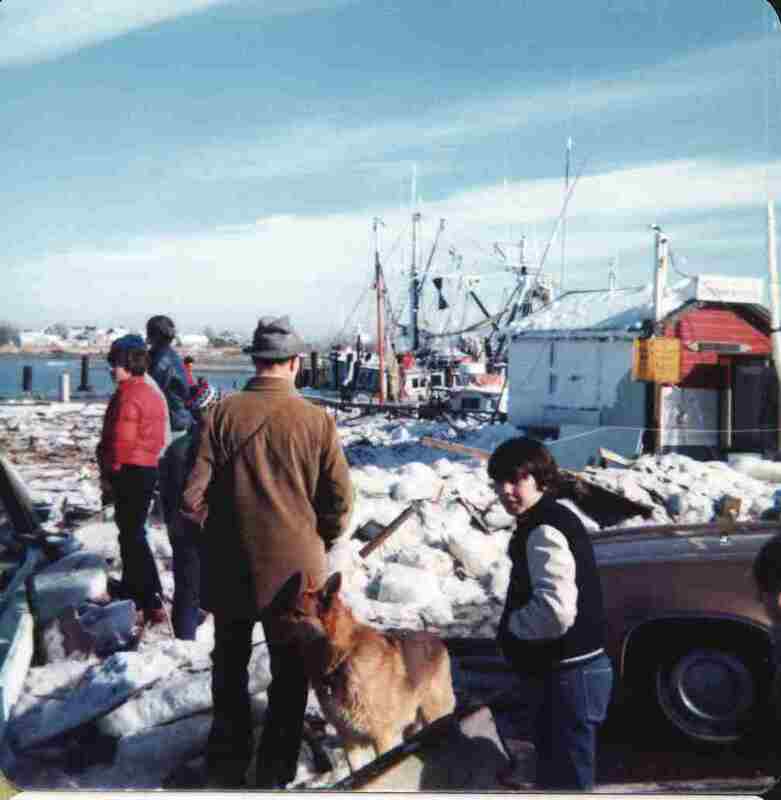 It will always be knowing as "The Blizzard of 78" and no one who lived through it will ever forget. Nor will we ever want to live through it again. This is the only photo I know of that shows me after the snow stopped falling. I'm the guy on the right. The other fellow was my good neighbor Fred Johnson. In 1978, I was living in Stoughton with my folks and teaching school in Brockton at a small parochial school. Interestingly enough, after the storm passed and ten days later when we finally got back to school, I had the kids put together a scrapbook of the blizzard as a school project. I remember telling them at the time, that the storm would be long remembered by their generation and to hold on to those scrapbooks. I made one as well, and I still have it. I pulled it out recently and shared it with my coworkers at the Marshfield Town Hall, many of whom have their own vivid memories. 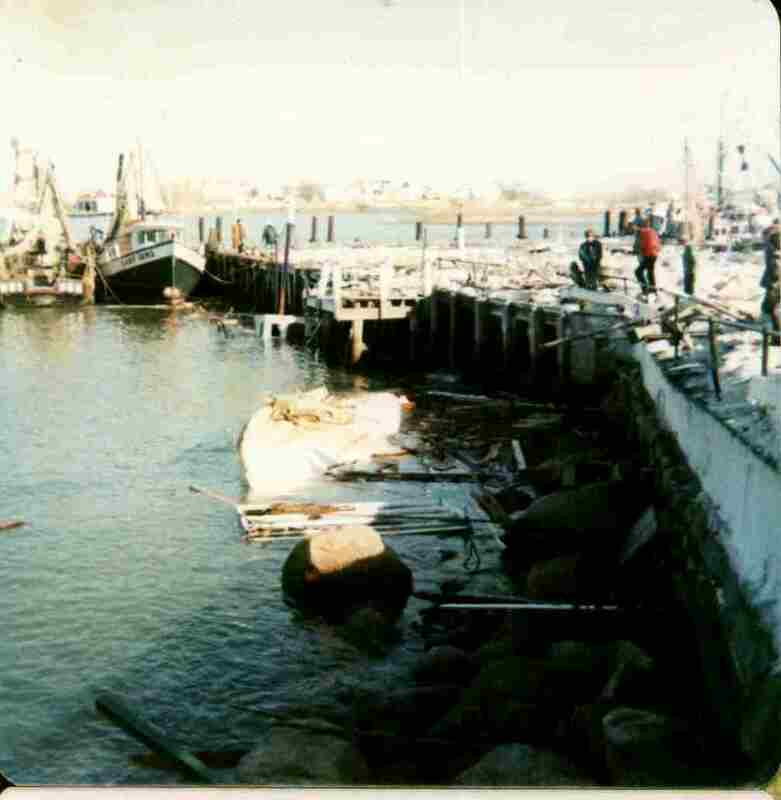 The Monday, February 6, 1978 Brockton Enterprise had a headline which read "Brockton Area Braces for Major New Storm". This was on top of a big snow storm that we had on January 20th which had dropped 2 feet of snow on Boston. I had dropped my car off to be serviced in Marshfield, where I also worked part-time at the First National Store. My dad was going to pick me up after school on Tuesday and drive me to Marshfield to pick up my car. Tuesday morning, the school got a call telling them to dismiss the students at 10:00AM due to the pending storm. I thought, at the time, that it was rather odd that they would cancel the rest of the school day before the snow even started flying. The sky was a steely grey and it looked like snow and felt like snow but it hadn't started yet. Odd!! At any rate, I called my dad and asked him to pick me up early because they were canceling classes. About a half an hour later, my dad arrived at the school, picked me up and I assumed was going to drive me to Marshfield to get my car. When he left the parking lot and turned west towards Stoughton, I asked him why we weren't going to Marshfield. He said that the storm was almost on top of us and he wanted to get home as soon as possible. Odd!! Within five minutes of picking me up, the first flakes began to fly. And boy did they fly! Our commute home from Brockton was about a fifteen minute drive under normal circumstances. Within minutes, we were in white-out condition and the commute took over a half an hour. By the time we arrived at home the ground was already covered in white. That was the last time that we could get out of our driveway or street until Friday. In Stoughton, we never lost our power, so we were able to keep tabs on the storm by watching TV and checking out Governor Dukakis' many different sweaters as he reported to the public from the state emergency headquarters. It was amazing to see the scenes of Rt 128, and Boston harbor as well as the news reports from Hull, Scituate, Marshfield and all up and down the coastline. We could see the fire in the distance that destroyed the St. Joseph's Convent because the fire trucks could not get to it. The plows gave up trying to plow the side streets because they simply could not keep up with the snowfall. Consequently, by the time the storm abated, there was almost 4 feet of snow in the street and it took front end loaders to clear it some four days later. My brother Brian and I spend most of Tuesday, Wednesday and Thursday shoveling the driveway. Often to no avail. The snow just blew back in. I remember shoveling after dark and hearing thunder and seeing lightning. Guess it would have qualified me for the military draft!! On Friday, I got a call from my boss at the First National in Marshfield asking me if I could come in to work. I recall telling him that the Civil Defense was not allowing anyone, other than emergency personnel, to travel the roads. He told me that as a food store worker, we were considered 'essential' workers and I would be able to get a road pass. So I went to the Stoughton Police Department and they issued me a pass to travel on Route 139 from Stoughton to Marshfield. My dad finally was able to deliver me to the garage (fortunately it was on Rt. 139) and I was able to get my car and get to work. The next day, I went down to Brant Rock to check on our family cottage on Island Street. It was clear that the water had come up inside the house about a foot or so. Never before and never since has that happened. Not even during the No-Name storm of 1991. I also went up to Blackman's Point, the trailer park in Brant Rock where I had spent my summers as a child. The trailers were tossed around like toys. I took a number of photos that are safely kept in that old scrapbook that I made with my students. As I write this recollection, I have my scrapbook next to me. I hope my students took my advice and kept their scrapbooks, some of which were quite remarkable as I recall. As time goes by and our memories fade as to how bad that storm really was, these photos and news article will help us remind of those three fateful days. I want to thank you for your website. It is quite spectacular and like my old worn scrapbook is a vivid reminder of why living in New England is always interesting!